SARAH LIVINGSTON JAY wrote again to her husband John on 12 November 1794 expressing her satisfaction with their children. . . . . To-day I’ve recd. a letter from Maria from Bethlehem, I’ll inclose it for your satisfaction. We have as much reason as ever Parents had to be grateful on account of our Children. I ask’d your dr. little son [William, 1789-1858] what I should tell you of his little sister [Sarah “Sally” Louisa, 1792-1813]. He said I should tell you she talk’d enough to employ three tongues to repeat. In short, if it was not for your little Counter-parts, I should want chearfulness & vigour to enable me to perform a variety of extra duties that devolve upon me in consequence of your absence. To-morrow I shall resume my pen. Upon learning of his daughter Maria’s enrollment in the Bethlehem Academy John Jay wrote her this letter dated 9 December 1794. He was always giving advice to his children in a rather pedantic way. Mama informs me that you had sollicited, and obtained her consent, to pass some months at Bethlehem, from an Expectation that you would there have better means of Improvement than at New York. Your motive certainly was laudable, and I sincerely wish your Expectations may be realized. As much will depend on yourself, as well as on your Teachers. I flatter myself that they will derive Credit, and your Friends Pleasure, from the Progress you will make. I do not mean by this remark, to urge you to unceasing application. Exercise and Relaxation are essential to Health; and Health is a Blessing without which no other temporal ones can be enjoyed. Apply diligently, and play heartily. I need not add properly, of that I am sure you will be mindful. source: Selected Letters of John Jay and Sarah Livingston Jay, compiled and edited by Landa M. Freeman, Louise V. North, and Janet M. Wedge (Jefferson, NC: McFarland & Company, 2005), 241, 243, 247. 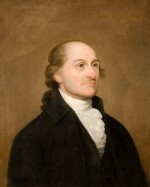 Jay’s portrait is by John Trumbull, dated 1794 when the two were in London, Trumbull serving as Jay’s secretary. It is at the John Jay Homestead State Historic Site in Katonah, NY.